Henna is a plant (Lawsonia inermis) that grows in India and the middle east. For millennia the women of that area of the world have ground this plant and applied it as a paste to create rich, beautiful body art, particularly on hands and feet. It is in particular a bridal tradition in some parts of the world. I purchase henna powder and mix my own with lemon juice and essential oils, then put it in a cellophane cone and apply to the body. When first applied the paste is thick and dark. When removed, it is a rust-orange color that will darken in the next couple of days. Henna works better on hands and feet because of the thickness and warmth of the skin in those areas. I have not found it to work very well on upper arms or chests, although the darkness of the image and how long it lasts depend upon the pH of your skin. How long do they last? 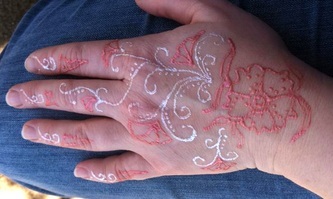 In India tradition has it that the longer your bridal henna lasts, the longer your marriage will last. Again, it depends upon the pH of your skin and where it is applied but it can last anywhere from a week to almost two months. Unlike the other two media, henna stains your skin. Therefore it cannot be removed except by exfoliating, which takes time. You can encourage it to last longer by dabbing a little lemon juice on it every day. This is the ink used by Hollywood makeup artists to create real-looking tattoos for movies. I have seen a lot of people airbrush it on, but all of my designs are hand-painted with ink and a paintbrush. The ink is "set" with baby powder or cornstarch. It lasts for up to a week. You can encourage it to last longer by dabbing more cornstarch or baby powder on it after you shower. We have discovered that something in shampoo just trashes it, so be careful with that. You can wash it gently with regular soap, though. 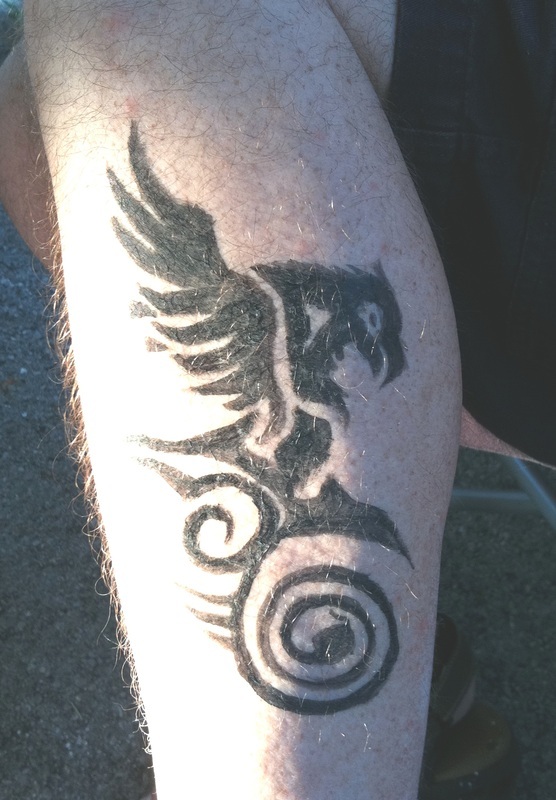 If you want something that looks like a real tattoo, this is the way to go. It's also my recommendation for things on upper arms, upper legs, backs, chests, etc. Hands, not so much. At the moment I only have this in black but colors are available if you desperately want them. 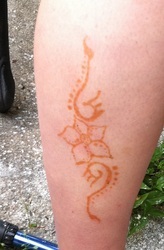 This is the newest media I've added to my henna repertoire. Basically, I apply glue (nonlatex, but if you are allergic to latex we should do a test spot) with a henna cone to create a henna design, then brush on very fine body glitter to set the glue and show the design. By doing the design in stages and carefully brushing the glitter on, we can do multiple colors. Depending on how much the area is rubbed, it can last from several days up to a week plus. 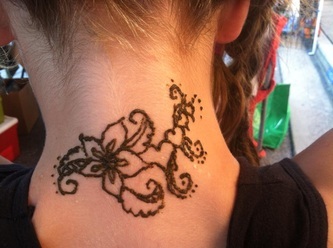 It can be worn under clothing and I can also use it to accent a design done in regular henna. If you are in the middle Tennessee area I am available to do henna for you by appointment. I also do henna at several local fairs and functions. See the bottom of this page for upcoming events. Also, if you like, I can do henna parties or you can have me come and do henna at an event or function you are hosting. Designs begin at $4 for something very simple, and travel time from Sparta, Tennessee will be added on to the cost of an appointment. Parties will be done at a flat rate, or if you like, you can have your guests pay for their own designs and you just pay the travel and base rate. Either way, email me for details.